I went to high school in Medicine Hat, AB, where I also completed a year of engineering at the Medicine Hat College. I then moved to Brandon, where I am now in my fourth year of Geology (Honours) with a minor in physics. I have been an active member of the BU Geology club for the last 4 years, serving on various positions on the executive, and this year I am president. I am a student member of several geology-related organizations, including the Association of Professional Engineers and Geoscientists of MB, CIM (Canadian Institute of Mining), SEM (Society of Economic Geologists), and PDAC (). In May 2008, the Canadian Society of Petroleum Geologists selected me as one of 31 students from across Canada to attend the two week Student Industry Field Trip in Calgary to learn about petroleum geology. This trip included visits to Dinosaur Provincial Park and a four-day trip through the Rockies, including a fly-over in a private plane over the same route taken through the mountains. 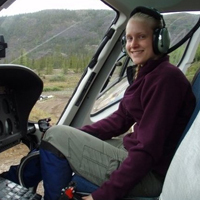 In May 2009, the Professional Developers Association of Canada selected me as one of 24 students to attend the Student-Industry Mineral Exploration Workshop in Sudbury, Ontario, which was a two week workshop to learn about mineral exploration. This trip included mine tours, a tour around the Sudbury Basin, a four-day trip through Val d’or and Rouyn-Noranda mining camps, as well as many keynote sessions. I have been awarded scholarships from the Canadian Institute of Mining, the Women’s Association of Mining, The Canadian Mineral Industry Education Foundation, as well as various BU awards. I spend the majority of my time working on my honours thesis, organizing trips and fundraising events for the geology club, and tutoring students in geology. I grew up in Medicine Hat, Alberta, and lived in Edmonton, before moving to Brandon. I enjoy camping, hiking, and martial arts, and basically anything that gets me away from the city. I was first interested in engineering, but after working for an engineering company during my studies, I found life behind a computer desk to be boring, so I decided to pursue a career that would allow me to travel and work outdoors. I have been fortunate to gain work experience in geology throughout university. I worked in Calgary, doing petroleum exploration, Bissett, Manitoba, doing gold exploration, and Great Bear Lake, North West Territories, doing uranium and iron oxide-copper-gold exploration. Being able to take a helicopter to work every morning is a definite perk of being a geologist! Geology has become my passion, and I enjoy doing research related to economic geology. I am continuing with graduate studies at University of New Brunswick in Fredericton next year. I may continue with a Ph.D. afterwards, or I may work in mineral exploration. It is my goal to one day have my own junior mineral exploration company, and to travel around the world doing what I love. Melissa Anderson will be graduating from a 4-year BSc (Honours) in Geology this spring (April, 2010) and will be continuing her studies starting her Master’s degree in Nova Scotia in the fall. We have known Melissa in her final year of her degree being involved in several aspects of her thesis project. Melissa has patience and determination and is knowledgeable about her thesis work. In addition, Melissa is attentive during class and shows focus and direction, assuming a leadership role during in-class interactive exercises where she is also helpful towards fellow students.Her fundraising and organization of events for her fellow students is non-stop. She is willing to dedicate her time to raise funds to subsidize field trips and conferences for her peers contributing to the experiences necessary to be involved in the field of Geology. Melissa’s hard work and knowledge is reflected in her multiple years on the honours list and induction into the president’s honour society and numerous scholarships including the Christopher Riley Memorial Scholarship for highest standing in third year Geology, the Glenn D. Hockley Scholarship in Geology, the Riley Memorial Scholarship for second highest standing in second year Geology, the John Malcolm Brodie Memorial Bursary, the Campbell Bursary in Geology, and the Dr. Charles Whitfield Clark Memorial Scholarship in Political Science . Her dedication to her studies, her work, and her volunteer activities are exceptional! Even at this early stage in her career, it is easy to see that Melissa has an aptitude for her chosen field. Melissa’s contributions to the department and her abilities should not go unrecognized on International Women’s Day.